My wife and I stayed in Palm Court Apartments for ten days and found the staff very friendly and helpful. Apartments were in a good location and were clean. We never had any of the food but did see lots of others enjoying meals time and time again so must have been ok. The bar staff were friendly, overall we had great time and would stay again. Sue & Alex from Redcar. 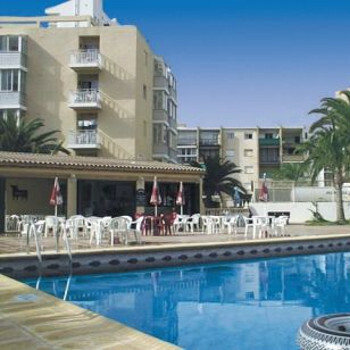 we stayed in the palm court apartments benidorm, 8 of us and we had the best time ever, the rooms were clean, the food was great, ideally placed not to near noise yet not to far from pubs,clubs,shops and beach. hotel staff were fantastic and very helpful at anytime of day or night. stayed 4 nights over xmas.apartments are very small big enough for 2 for a few days but not suitable for a family of 4 as the sofa bed when opened takes up the whole floor space infront of the door so could be a problem in an emergency.to get into it you have to climb in at the end of the bed and up to the top. they are clean but very dated.we stayed 5 days did not have towel or sheets changed or saw any maids. our apartment no. 6103 on the 3rd floor was very dark and cold the ancient heater was not adequate for this time of year.there was a huge fir tree just outside the balcony the same would apply on all floors with room no. ending in 3.the balcony was very tiny and enclosed in glass sliding windows making it unbearably hot in summer as there is no aircon. the staff are very freindly and speak good english.there is a bar on site serving good meals and snacks and is open until late. if you are looking for a cheap clean apartment with the nightlife on your doorstep then this is it. The rooms are basic but clean with kettle and toaster and complete kitchen equipment and utensils. The Pool area and bar/cafe are superb. Josie and Gary are brilliant, very helpful and friendly as are Laura and her boyfriend who cover for 2days. The 24 hour bar at the front is great for a quick drink on the way out or a night cap after a good night out. The location is great just up the road from the main bars and clubs, yet not too noisy. Bus stop to the airportis nearby and the old town is an easy 20 minutes walk. Had a great holiday will return one day. As the name implies we were a party of 8 blokes, on a long weekend, celebrating a friends birthday. The rooms are small and basic, but served our needs, as we only wanted somewhere to shower and sleep. Josie and Gary do a nice breakfast, but that is all we ate there. Showers are dangerous as they go from boiling hot to freezing cold. As a group of blokes on a jolly up we would go back, but we would not entertain taking wives and kids there. Yes the rooms were basic but then you are not there to stay in them all day. The food was excellent plenty of pie and chips and cheesy chips! and the hotel and bar were great and inviting and kept us entertained on an evening. We booked the 8 night stay with Thomson from Boxing day over the new year period. When we arrived we were met by staff who were really friendly and efficient and the check in took about 5 minutes and we were shown to our room which was a nice touch. Never had any food in the hotel so can't comment on that although we did have a couple of drinks in the bar and again the bar staff were really friendly. Entertainment was a guy who does the karaoke of a night-time. I did actually raise a complaint (which I have never done on any holiday) to the manager who did take on board my issue as the cleaning staff open all the apartment doors at once and then set about cleaning them one at a time which leaves security an issue in my eyes if you are not in your apartment when they clean, this he took on board but just keep an eye on the situation. I must admit that they are basic, do need a lick of paint and the sofa beds are dated and can be quite noisy if anybody is a light sleeper but we would use them again although Thomson no longer have the contract as the owners are going self sufficient. i think the staff were really talkitive and frendly. the food was great and the cleanliness was good but very good when serving food. the location was great it was near everything that i needed it to be. there wasnt much entertainment but when there was it was good. i would defently visit it again.